Amazon has an Exergen Temporal Thermometer Deal, $27.90, Free Shipping with Prime or $49 order. Rated 4 out of 5 stars. 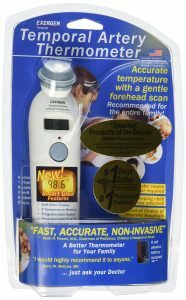 We have one of these thermometers and find it works well, especially if you have kids. No need to stick something in your mouth for several minutes. Just put the Exergen on your forehead, move it slightly and you have a reading. Battery seems to last a very long time.